Boosting Resilience is pleased to announce Beyond Resilience: Co-designing our creative futures. The forum will be a highly participative day of workshops, discussions and peer-to-peer sessions focused on organisational and personal resilience as well as resilience in the wider world. It is aimed at artists, leaders working in the arts and cultural sector, funders, policy-makers and others engaged in the development and sustainability of the sector, as well as researchers and those who collaborate more widely with the sector. Participants will be encouraged to come to the forum prepared to share their thoughts, voices, and expertise and will be invited to work with us to co-develop a Manifesto for Resilient Creative Futures. Professor Phil Scraton (Professor Emeritus, School of Law, Queen’s University Belfast, member of Hillsborough Independent Commission). Beyond the purely practical, the day will also support attendees to take time out, reflect and to hear perspectives on resilience from within and beyond the arts and cultural sectors. Please note that we do have a limited number of reduced cost tickets (£20) for individual artists/creatives and for micro or unfunded arts and cultural organisations. Please email info@tcce.co.uk with a short note on why you’d like to attend. Please note these tickets are strictly subject to availability. 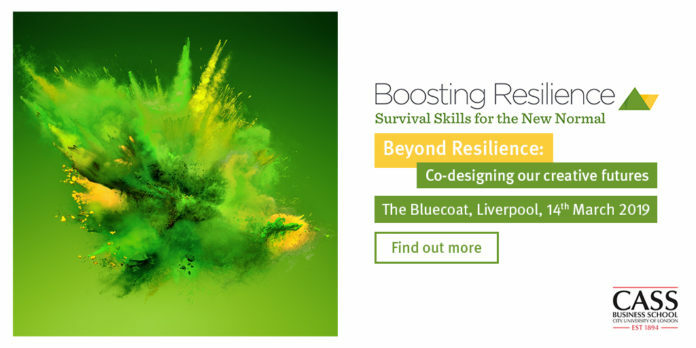 ‘Boosting Resilience: Survival Skills for the New Normal’ is an intense, catalytic and boundary-pushing Executive Learning programme running from 2017 – 2019, funded by Arts Council England as part of their Building Resilience Programme. The programme supported arts leaders from around the country to developing new approaches to making the most from their creative assets and Intellectual Property.